Was born March 20, 1934 in Anadarko, OK to Aut Sharlin and Rosa Videlle (Dowdy) Pendley. He passed away March 13th at his home in Cyril at the age of 76. After graduating from high school, he served in the U.S. Navy and was honorably discharged. He married Ernestine Patricia Taylor on December 4, 1958. She preceded him in death on August 9, 2008. He was a ranch foreman and worked in the oilfield before going to work as a police officer for the Anadarko Police Department until he retired in 1975. He also worked a mechanic all his life. 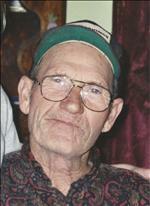 Gene enjoyed fishing, camping and hunting. He loved to go dancing with his wife, and was a good rollerskater. His greatest joy was spending time with his grandchildren. A Memorial Service for Mr. Pendley will be held Wednesday, March 16th at 10:00 A.M. at the Full Gospel Holiness Church with Pastor Donnie Miller officiating. Burial will follow at a later date under the direction of Cyril Funeral Home. Viewing will be held Tuesday, March 15th from 9 A.M. until 8 P.M. at the Cyril Funeral Home. A Memorial fund has been established to help with funeral expenses for Gene Pendley. Contributions may be sent to the First National Bank and Trust Company in Cyril.